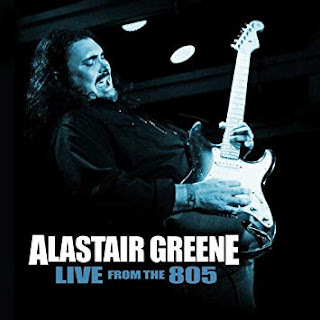 I just had the opportunity to review the most recent release, Live from the 805, from Alastair Greene and it's a real rocker (and a double live rocker to boot)! Opening with blues rocker, The Sweetest Honey, Alastair Greene uses classic rock riffs to propel his band into orbit. Backed by Jim Rankin on bass and Austin Beede on drums, these guys are really rocking with excellent guitar soloing by Greene. On boogie track, Big Bad Wolf, Greene's strat has a classic grind and his vocal paired with Rankin are very cool with a ZZ Top edge. With plenty of swagger and excellent guitar blues bends, 3 Bullets has a great feel. This track is made for Greene's guitar style, really bringing out his tight yet raw attack. Very cool. With a Bo Diddley riff and super fat slide guitar Greene gets a great groove going on Say What You Want. His slide finesse is nicely coupled with his solid vocals and the bands tight bottom. Another track with a cool feel is Love So Strong. Setting a firm footing for the track the band pulls it way back and Greene solos with very light backing. Fiery slide work is the ticket on blues fused Down To Memphis. With just a touch of country in Greene's vocals and a pounding beat by Rankin and Beede, this is a great track. Wrapping disc 1 is jazzy instrumental, Lucky 13. Greene really sets the torch on this one with hot fluid riffs. Excellent closer for disc one. Shuffle track, Back Where I Belong, has a great feel and again Greene really lights it up. Excellent! With a George Thorogood kind of feel, a lumbering bass line and grinding guitar riffs, Green send off the last Train Around The Sun. Using that droning bass line to full advantage, Greene steps up and hits the grand slam with soaring guitar solos and grinding vamps. Very nice. Another track that I really like is Rain Stomp with it's Led Zep like feel and vicious slide riffs. Big Boss Man gets a more modern bounce rhythm and reverb on the rhythm guitar but with straight ahead guitar ripping on the lead. Very cool. . Wrapping disc 2 and the concert is Walking In Circles with it's driving pace and rock solid bottom. With rabid slide guitar and the cohesive feel of the band, this is a terrific closer for a really strong release.